The Hearst Corporation created a British edition along the same lines in 1922. In April 1912, a year after Hearst bought the magazine, Harvey W. Wiley, the first commissioner of the U.S. Food and Drug Administration (1907–1912), became head of GHRI and a contributing editor whose "Question Box" feature ran for decades. Beginning with a "Beauty Clinic" in 1932, departments were added to the Institute, including a "Baby's Center," "Foods and Cookery," and a "Needlework Room." Some functioned as testing laboratories, while others were designed to produce editorial copy. 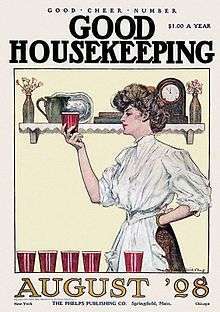 Good Housekeeping began to be published in the United Kingdom in 1922. In Latin America and particularly in the Latin American community resident in the United States, the magazine is known in Spanish as "Buenhogar" and is published by Editorial Televisa. The magazine advocated pure food as early as 1905, helping to lead to the 1906 Pure Food and Drug Act. It prohibited the advertising of cigarettes in the magazine in 1952, 12 years before the Surgeon General's warning labels were required on cigarette packs. During the 1930s, it endorsed the Ludlow Amendment, which sought to require that any declaration of war, except in the event of an invasion, be ratified by a direct vote of the citizenry. ↑ Belkin, Lisa (June 15, 1985). "Good Housekeeping's Seal Stamps Its Approval". Milwaukee Journal. Retrieved June 18, 2010. ↑ Magda Ibrahim (February 12, 2015). "Magazines ABCs: Women's monthlies led by Good Housekeeping". MediaWeek. Retrieved April 24, 2016. ↑ Ping Shaw (1999). "Internationalization of the women's magazine industry in Taiwan context, process and influence". Asian Journal of Communication. 9 (2). Retrieved March 17, 2016. ↑ Steigrad, Alexandra (12 November 2013). "Good Housekeeping Names Jane Francisco". WWD. Retrieved 12 November 2013.